DIY - Toilet Seat Toss fundraiser! padded ones I found are more durable). Second hand is fine as long as they are clean. I have used this at a western themed event. Play instrumental western music in the background. 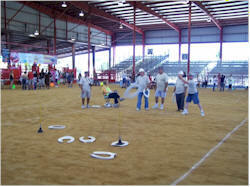 Supplies needed: 2 plungers & 2 toilet seats – one set (2 plungers, 2 seats) for every 2 teams.